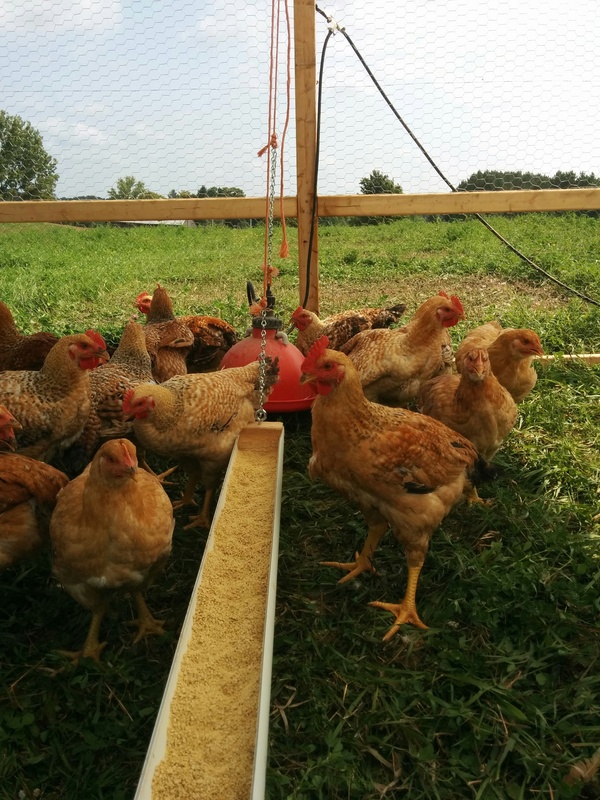 We now have this season’s pasture-raised chickens for sale. 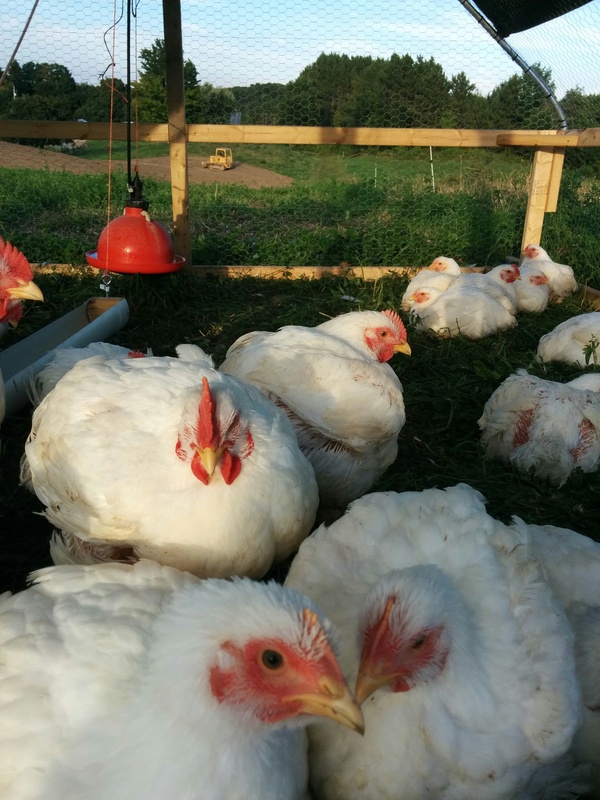 Over the past few years, we have enjoyed raising chickens, given that they are a great complement to a mixed farm. It has been amazing to see how much the chickens improve the pasture by adding their own unique “fertilizer”! We have received lots of positive feedback from our chicken customers over the past two years. You really can taste the difference of a pasture-raised, organic chicken. The chickens we are raising are Bonnie’s Heavy Red and White Rock. We have been feeding the chickens Certified Organic, non-GMO feed, along with their forage of grass, clovers and insects. Pasture-raised means that our chickens live on grass, all the time. They are raised in move-able coops called chicken tractors (see photo below), to protect them from predators, and to allow them to have access to fresh pasture every day. Providing pasture for chickens produces meat with higher amounts of omega-3 fatty acids and antioxidants. For more information about the health benefits of eating pasture-raised chicken, CLICK HERE. WHY DO WE FEED ORGANIC GRAIN? Pasture is not enough to sustain a chicken. We also feed them grain. We believe that feeding organic feed to our chickens offers the chickens better nutrition and therefore produces better quality meat. We also believe in supporting the work of organic grain farmers. This decision does come with a price – our feed costs are significantly higher (than both non-GMO and non-organic feed) since we feed a Certified Organic grain mix. ***For those of you interested in our pasture-raised pork, please stay tuned for ordering information later in September/October for pick-up in November. We are selling whole chickens that will come frozen and vacuum-sealed, with giblets (heart, liver, neck) included inside the bird. We are estimating that chickens will range in size between 5 – 9 lb. The price for chicken is $5.50 / lb. We will do our best to accommodate size preferences IF WE CAN depending on the orders that we receive and the sizes of our chickens. There is no minimum or limit to the number of chickens that you can order. Orders will be taken on a first-come-first-served basis. Please place your order by sending an email to fiddlefootfarm@gmail.com and providing the information listed below. Last year, we sold out in less than a week, so to avoid disappointment, don’t delay in placing your order. We will let you know which day to come to pick up your chickens (either Thursday Sept 8th or Monday Sept 12th). We will send you more specific details closer to the pick-up date regarding time and logistics to those who order chickens. It is important to us that you can make it on the specified day as the chickens will be frozen and our freezer space is limited. If you cannot make it, consider sending someone in your place or please let us know in advance. Over the past few years, we have enjoyed raising pigs on pasture on the farm. 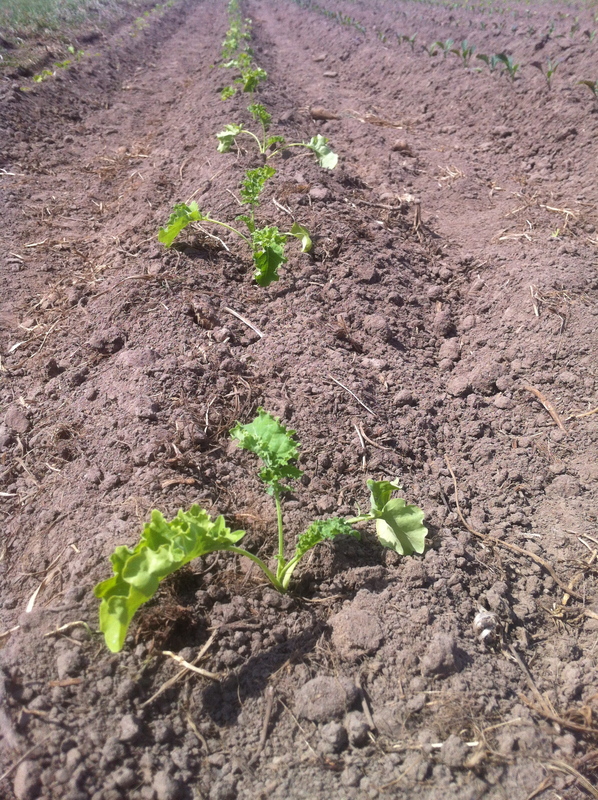 They are a great complement to a vegetable farm, always happy to receive any vegetables we have to spare! This year, their pasture was in a section of the farm along a fence-line under the trees. We really enjoy having them here, getting to see them eat pasture, roll and lay in puddles or in the sun, root about for insects, chase each other around, and enjoy vegetables from the garden. This year’s pigs were also treated to skim milk on occasion, from our milk cow Amethyst. The pigs we raised this year are different from the breed we have raised in the past. They are a Berkshire / Tamworth / China Poland cross. Along with grass, insects, and vegetables, we have been feeding the pigs Certified Organic, non-GMO feed. We are also treating them to apples. HOW CAN I BUY PORK? 20-25 lb mixed cut bundles – $8.00 /lb. Cuts vary per box, but generally include smoked ham, roast, pork chops, sausage, bacon, ground pork, and possibly ribs. All meat will come frozen and requires 1-1.5 cubic feet freezer space. Side (Half pig) – $5.50 /lb. based on hanging carcass weight, which typically ranges between 70-90 lb per half. Hanging weight includes bones, so you will receive less than this amount of cut meat and will therefore be paying more than $5.50/lb for the meat that you receive. Requires approximately 3 – 4 cubic feet of freezer space. You decide how you would like the meat cut (steaks, hams, sausage, ribs, bacon, ground pork, etc.) and any curing / smoking that you would like done (some additional charges will apply). We would be happy to help you with your options with this. Please note: Butchering instructions for side orders need to be provided to Amy at Fiddle Foot Farm by November 1st for pick up on the 16th or by November 15th for pick up on the 30th. We will accept orders for both bundles and halves on a first-come-first-served basis. Please place your order by replying to this email. We ask for a $100 deposit for a Side (cash, cheque or e-transfer to fiddlefootfarm@gmail.com) to secure your order. Remaining payment will be collected when you pick up your pork at the farm on your pick-up day. No deposit is required for a bundle. When you place your order, we will let you know which pick-up day to come. We will send you more specific details closer to the pick-up date regarding time and logistics to those who order meat. It is important to us that you can make it on the specified day as the meat will be frozen and our freezer space is limited. If you cannot make it, consider sending someone in your place. Please be in touch if you have any questions. It has been a gorgeous week of garden work here on the farm. The shorts and sun hats are out as we take the first transplants out to the field. We have done our first plantings of onions, green garlic, kale, cabbage, broccoli, swiss chard, lettuce and seedings of spinach, salad greens, beets, carrots… and I’m sure I’m forgetting something! We are looking forward to Opening Day at the Orangeville Farmers’ Market on Saturday May 9th, 8am – 1pm followed by Opening Day at the Creemore Farmers’ Market on Saturday May 16th, 8:30am – 12:30pm. Hope to see you there! Also, we are now on Facebook! We invite you to come and find us there, “like” us and share Fiddle Foot Farm with your friends! We are fortunate to have several dedicated champions of local food in our community. Over the past year, we have connected with the Education, Literacy and Access committee of the HFFA (Headwaters Food and Farming Alliance). We have enjoyed opportunities to visit schools and help to deliver workshops on local food and farming as well as supply vegetables for various school initiatives, such as a “Growing Home” Local Food Club where families purchase monthly deliveries of local foods and special educational days featuring specific vegetables. 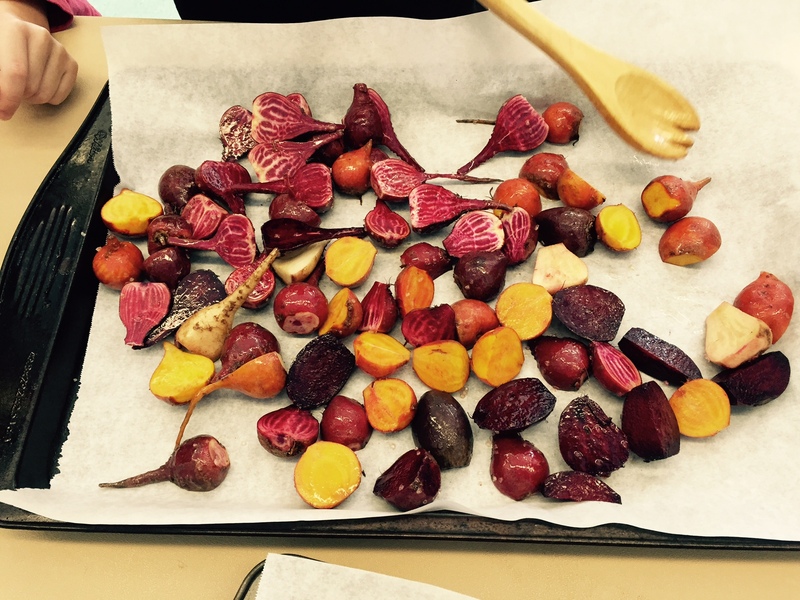 Recently, the Primrose Elementary School Eco-Club celebrated Beet Day! 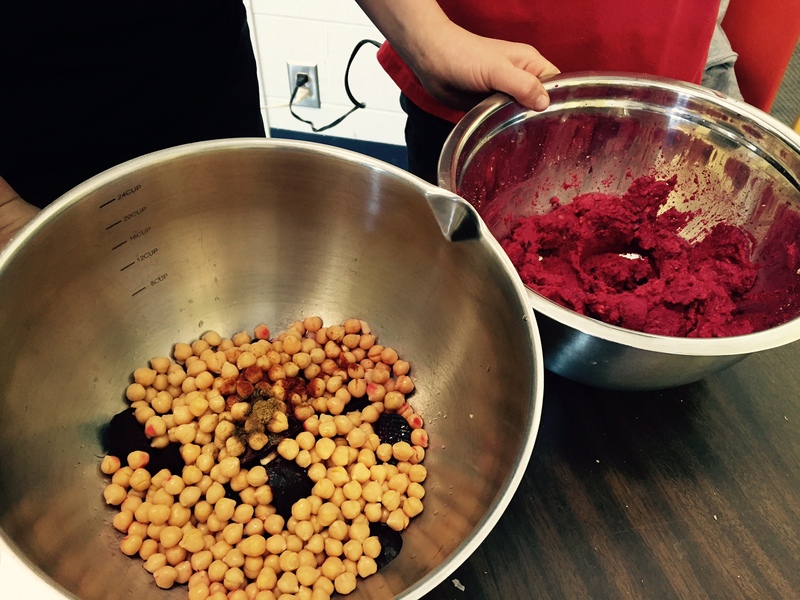 Students learned all about beets – different varieties, nutritional information and they had the chance to try out some recipes (Roasted Beets & Beet Hummus). Apparently, teachers reported a “feeding frenzy” when it came time for the Grade 7 & 8 students to taste what they had made. When gratitude was expressed by an organizer for “growing awesome beets”, my response was that it is a pleasure when we see them being put to such great use! What an incredible learning opportunity for students, appealing to all of their senses, empowering them with food skills and the appreciation for healthy AND delicious food. Beet Day sure beats (or should I say beets!) Pizza Day and Hot Dog Day! Kids know real food when they taste it – they just need more opportunities to engage with it and give it a try! Keep up the great work, we love what you’re doing! If you are in the Orangeville area on a Saturday morning between 9am and 1pm, we’d love to see you there! Happy New Year from Fiddle Foot Farm! This is the time of year when we look back to last season’s successes and challenges in order to plan and improve for the coming year. We will be putting together our seed order for all of our favourite vegetable varieties, we will be interviewing applicants for our apprenticeship program and making plans for the growing season ahead, all while looking out the window at a snow-covered farm! Thank you to all those who participated in the Winter CSA program (final two pick-ups January 8th and January 22nd). We hope that the vegetables have inspired many comforting wintry meals to keep everyone warm this winter. 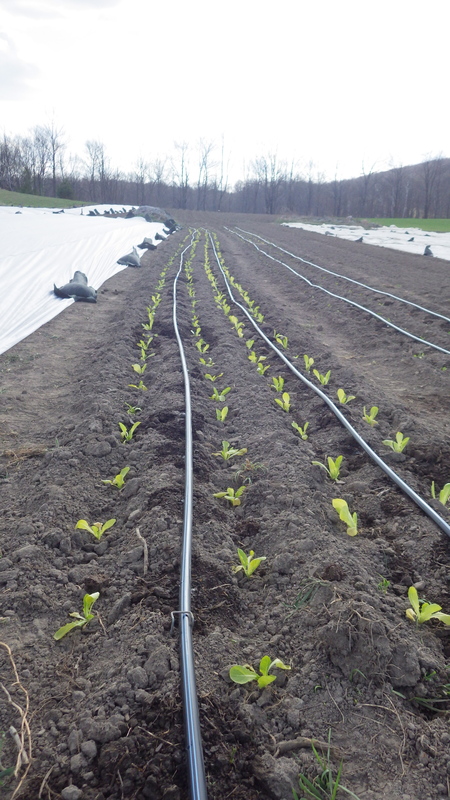 We are enjoying sunny days in our greenhouse, where we wash and pack vegetables on days when the weather permits! After seven years of washing root vegetables with a hose in bins, we decided it was time to add an automated root washer to our equipment inventory. What a blessing it has been! If you would like to work with us as an apprentice for the 2015 season, please read our Apprenticeship page and send us your application. We look forward to hearing from you! While driving to the market early one Saturday morning this season, with Owen asleep in the back seat, I was overcome with gratitude. Gratitude to the family members, grandparents, aunts and uncles, who have helped make it possible for me to keep going to the farmers’ market each week this season, even with a new baby in our lives. Gratitude to the friends and CSA members who came out that week to help us with the harvest and who would be helping us out behind the market table that day. In a time of need, help came from all directions. When people come to visit the farm and are impressed with how much we have done, we always acknowledge that it is only possible with a lot of help! We are grateful to the many young people who, year after year, choose to spend a growing season working and learning with us. 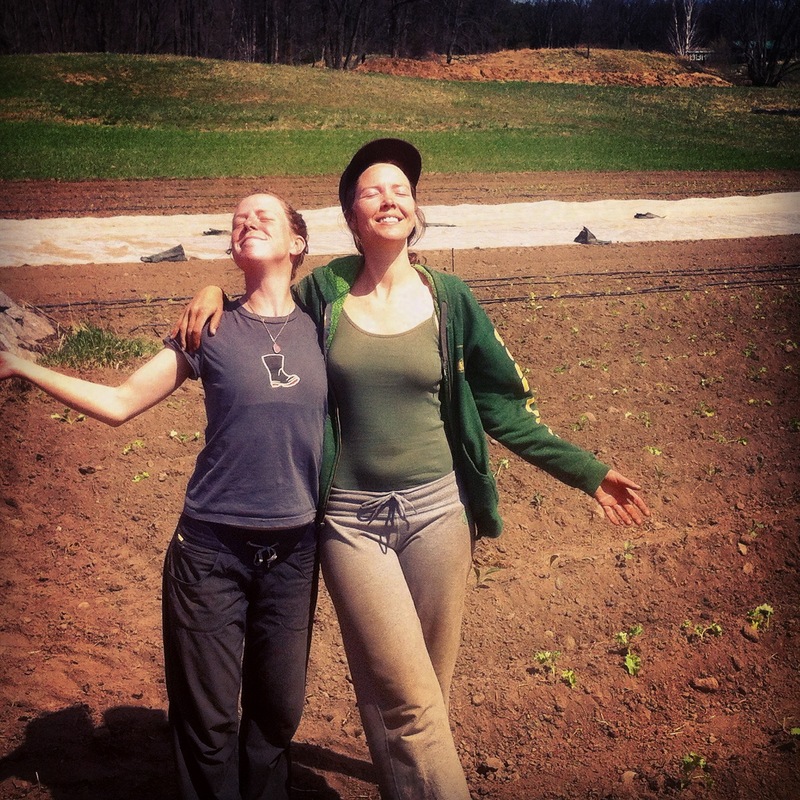 The apprentices we work with breathe new life into our farm each year. Over the course of the season, we hope that they are inspired by how much they can accomplish – that they see the rewards of working harder than they may ever have before! They bring enthusiasm and curiosity along with plenty of laughs! Since our arrival at Fiddle Foot Farm, we have discovered a warm community of neighbours with diverse and interesting pursuits of their own. These people enrich our lives and have supported us in many ways. There is one neighbour in particular (who, because he would prefer to, shall remain nameless) who we cannot thank enough. He will come over, rain or shine, at dawn or midnight, to make helpful mechanical repairs to whatever plagues us at the time! But our favourite visits from him are still the social ones, reminding us to chill out sometimes! Week after week, we love connecting with new and familiar faces at the farmers’ markets. Enthusiastic and conscious eaters who delight at the display of the season’s bounty on our table. This feedback is welcome and uplifting at the end of a week’s work in the fields. Without the commitment of our CSA members (Community Supported Agriculture), we can honestly say that none of what we do would be possible. Their choosing to become members and pay for their share of the season’s harvest long before receiving any of it, gives us the confidence (and funds!) to purchase seeds and equipment we need at the beginning of the season. We connect with these families through the food we grow, sharing favourite recipes and cooking tips, and we like to think that we join them at their dinner tables, at least in spirit! 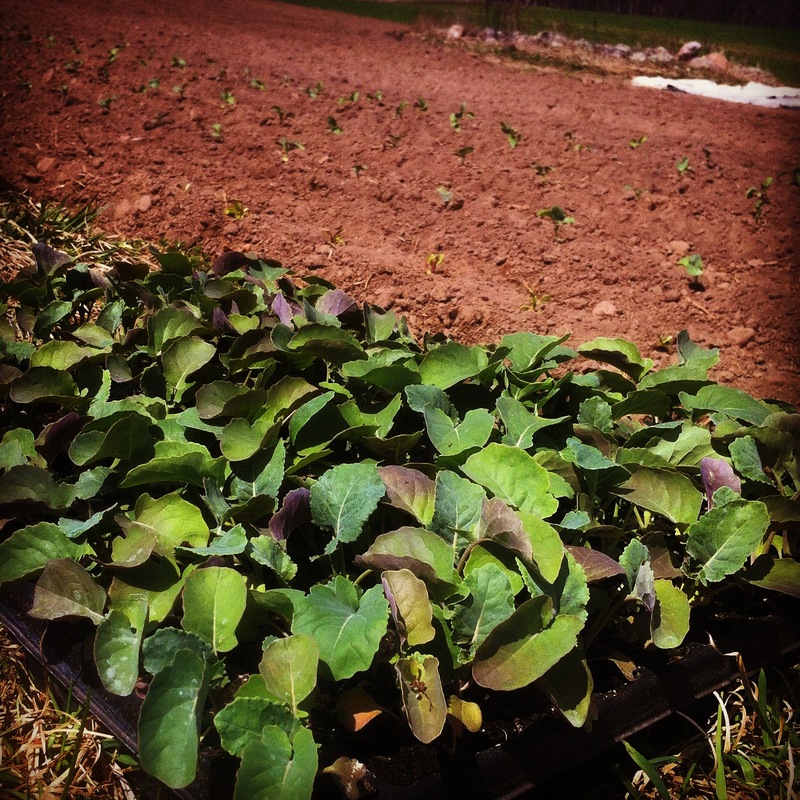 We extend a special thank you to all our CSA members… bon appetit! For the chance to work as closely as we do with the elements and forces of the natural world, we are also grateful. Well, perhaps there are times we don’t exactly feel blessed (during periods of drought or flood, or when we see the damaging effects of pests or disease) but just as often, we are overwhelmed by miraculous growth and stunning beauty! 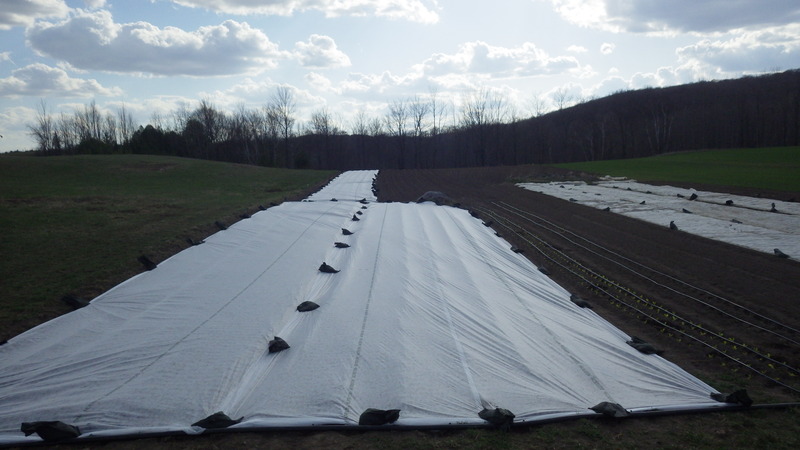 To accompany and encourage thousands of plants along their journey from seed is humbling and awe-inspiring. As long as we take the time to revel in this miraculous process, and in all of the relationships we have forged along the way, this will continue to feel like a charmed way to live. PS – In the spirit of the Inglorious Vegetables campaign, we have been selling “Misfit Carrots” at the markets for a couple of years now. 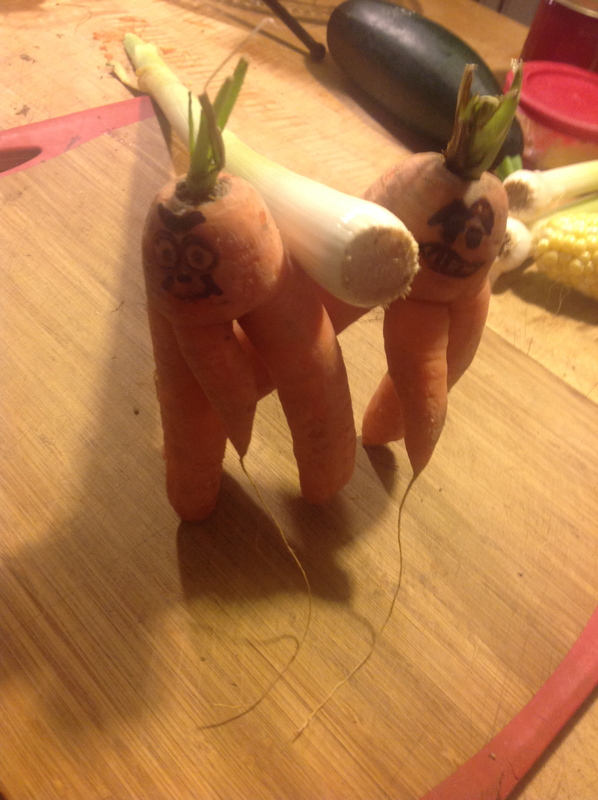 Earlier this season, our efforts were affirmed – check out the creativity of one of our members / customers… He calls it “Carrots Taking a Leek“…well done! Please visit our Recipes Page under "Resources"
Enter your email address to follow this blog page and receive an email when we make a new post - highly recommended for CSA members and regular market customers! 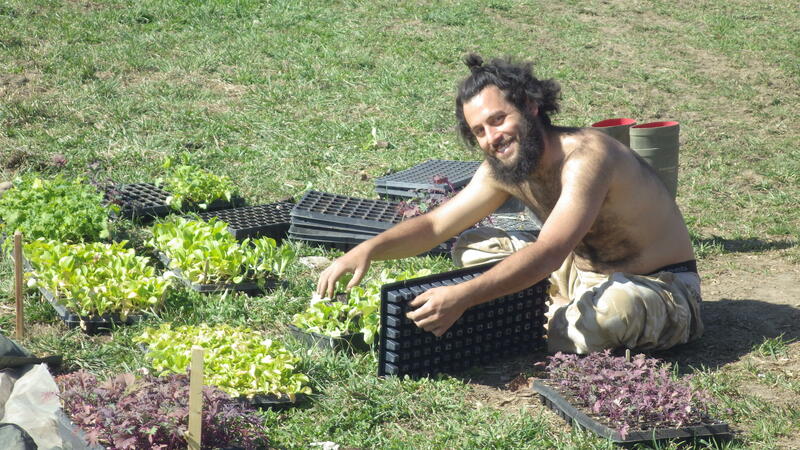 Interested in Growing Community Supported Agriculture? Where are your Winter Vegetables Coming From?